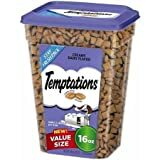 Found 11097 Treats Cat Products. Top your kibble with raw – all natural nutrition made from pure animal protein, fruits, vegetables and other whole food ingredients! Instinct Raw Boost Mixers are made with 100% freeze dried raw. Our raw cat toppers are natural, made from real meat and whole food ingredients, protein packed and minimally processed. 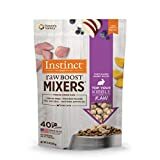 Instinct raw boost mixers are grain free dry cat food toppers made with protein packed, real meat plus non-GMO vegetables & fruits. Always made without grain, potato, corn, wheat, soy, by-product meal, artificial colors or preservatives. Instinct's raw, whole food ingredients are freeze dried to gently remove moisture, locking in nutrients and intensifying flavor. Add variety and excitement to every meal with the perfect freeze dried raw cat food topper for picky cats and kittens. Available in a variety of freeze dried recipes: cage-free chicken and farm-raised rabbit. Made in the USA with the finest ingredients from around the world. Satisfaction guaranteed. Questions? Call Instinct at 888-519-7387. 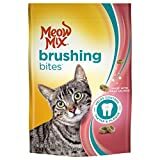 Helping care for your cat’s teeth has never been easier or more delicious with Meow Mix brushing Bites, bursting with the tasty flavors your cat will love! These crunchy treats are specially designed to help keep your cats’ teeth clean by reducing plaque and tartar when fed daily. They are fortified with vitamin d and calcium to help support strong teeth and bones so you can feel good about treating every day! This Wellness Kittles Cat Treat variety pack includes 3 Irresistibly Tasty Flavors (Chicken & Cranberries, Salmon & Cranberries, and Tuna & Cranberries). 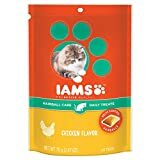 These are 100% Natural Crunchy Treats for Adult Cats. These crunchy cat treats are as tasty as they are healthy. Each all-natural bite is packed with BIG TASTE from whole-food ingredients. With nothing artificial & under 2 calories each, you can show your sweet kitty extra love with Wellness Kittles. You'll receive 3 Total 2 Ounce Pouches - One of each Flavor. 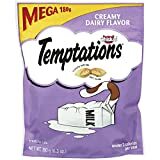 Whiskas Temptations Cat Treats, Creamy Dairy Flavor, 16oz100% nutritionally complete and balanced for adult cat maintenance. Plus, at only 2 calories per treat, your feline friend can enjoy the crunchy outside and smooth, creamy center anytime. 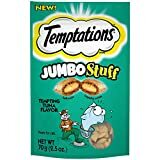 I didn’t even know it was possible, but TEMPTATIONS JUMBO STUFF Cat Treats are BIGGER than classic TEMPTATIONS Cat Treats…that means more of the irresistible filling that I LOVE! With the crunchy outside & the soft inside – it’s a match made in kitty heaven. And the tuna…oh the tuna. It’s a purrrrrfect match for my fish-loving belly. By the powers of Neptune, surrender the TEMPTATIONS JUMBO STUFF TEMPTING TUNA FLAVOR Cat Treats now!